We went past the Grand Floridian and the Polynesian Resorts, and then entered the Speedway…which, I noticed had a port-a-pottie station set up outside. I thought about stopping, but only after I had passed it and I didn’t want to backtrack, surely there would be another one again soon. First the Speedway. Many locals bring their classic cars to display on the track and cheer on the runners. This was an enjoyable distraction along the course. But there were no bathrooms! Lesson to be learned: study course maps before you run. Learn where the hydration, food, and medical stations will be, and do yourself a favor and find out where bathrooms will be! Why? Because as I exited the Speedway, I had to go. Oh sorry, forgot the TMI Alert! Yeah, the Chicago style deep dish pizza I had for carbo loading really wasn’t such a great idea (but it was oh-so-very tasty. We entered the Speedway just after mile 8, and there would not be another restroom until around mile 12. Now, fellow Casual Runners, if you do distance running long enough, these things happen. All you can do is Accept. Adjust. Advance. I slowed my gate, controlled my breathing, and just waited for the next restroom. I had to do whatever I could to keep going because quitting really wasn’t an option and would not have done me any good anyway. Oh yes, and during this stretch we passed the dreaded Disney sewage treatment plant. The infamous odors were definitely NOT what I needed when having to go to the restroom. But I endured and finally found the next set of bathrooms and was soon on my way to the Animal Kingdom. Melissa and I showing off our bling. Unexpected Magic. Outside of the Animal Kingdom cast members were gathered in an impromptu petting zoo with a collection of friendly animals who were there to be pet, hugged, and included in selfies. It was entertaining to see runners, who were so singularly focused on the race, lose their minds over the cute animals with whom they just HAD to take pictures. Just outside of Animal Kingdom park guests were trying to cross from the buses and parking lots to the main entrance. The cast members did a great job of keeping the course clear, but not everyone listens. As I crossed over a cross walk, I heard a cast member announce that people were clear to cross…AT THE CROSSWALK. Unfortunately, a very large woman who was much taller and heavier than myself, took this opportunity to jump off the curb and dash to the gate…however she didn’t make it, as, instead, she jumped right into me. It all happened so fast, all that I could do was react out of instinct. I grabbed the woman to keep her from falling to the ground, but all of our combined weight and my momentum were stopped on my right leg. I felt it pop, but didn’t react. I stood the woman up, released her, and then continued on my way, too angry to wait for any explanation or discussion (or most likely her yelling at me because in her mind it was my fault). About 200 or so yards down the course when the adrenaline started to wear off, I felt pain. Lots and lots of pain. Yup, I did some damage to my knee (or, actually, SHE did damage to my knee), but there was no way I was quitting. I was at the half way point. Finishing the next 13.1 mile was going to be hell, but I was going to finish. It is not a coincidence that I posed in a way that took the weight off of my right knee. We made our way down Osceola Parkway towards the ESPN Wide World of Sports. My knee was killing me. There were times were I had to come to a complete stop just to rest it. I used restroom breaks as an excuse to rest before resuming on my way. Afterwards my friends and family asked why I did not stop at the medical tent. To be honest, I considered it but was afraid they would pull me from the race, and there was no way I was not finishing this one. Wide World of Sports is nice, and it better be because you spend 5k of the second half of the race in the complex. My favorite part, however, was the high school bands. Yes, while the baseball stadium packed with fans was cool, you all know that I LOVE when the on-course entertainment is high school bands. These kids were enthusiastic, brought their A-game, and encouraged me to keep pressing on. Once you leave Wide World of Sports, the race gets so much easier, as you know you are a mere 10k away from the finish. And no runner – Casual or otherwise – wants to quit in the last 10k of a marathon if they can help it. We made our way to Hollywood Studios, which was tricky for me as the uneven asphalt was made more difficult by my injured knee, which was still bothering me pretty badly. In the backstage area I allowed myself to rest while I grabbed an offered snack – small candy bars – from the volunteers, but I could not physically get it down. TMI Alert. I have no idea why, but I spit the chocolate out in a gag reflex. I felt bad, but at least we were backstage and not out in the parks in front of the guests. I had to stick to gels the rest of the way. Running through Hollywood Studios while the park was open was fun. Little kids waved and cheered us on (I am convinced they thought that I was “somebody”). We passed the Sorcerer’s Hat (which I am sad to see go), and made our way down Hollywood Boulevard, which looked brilliant in the morning sun. Again, cast members were manning crosswalks to allow park visitors to pass through. Given what I had experienced not long before, this stressed me out. But the cast members were great and I made it through unscathed, this time. We exited Hollywood Studios and made our way along the waterways to the Epcot area resorts. This is one of my favorite areas of Disney World property to run. If you are not participating in a race and are just looking for somewhere to log some miles on vacation, this path is definitely the place to go. Sadly, the crowds were not as large as they had been during the Wine & Dine Half Marathon, but we were so close to the finish it didn’t matter. Once you leave the Yacht and Beach Clubs, there is a small climb to International Gateway, but with my knee hurting, I felt every time I put my right foot on the ground. At the top, Dopey was there at a picture stop with a line that looked like it had every bit of 100 runners waiting. I could not stop, if I did, with my knee, there was no way I would start up again. Race Icon. The only thing missing from the Princess and Wine & Dine half marathons is that you do not get to run around World Showcase. As this part of Epcot has always held a special place in my heart, it meant a lot of me to take a victory lap around the World Showcase Lagoon in the last mile of my first ever marathon. With the exception of a few surly guests in Germany who somehow figured that the marathon was “ruining” their vacation (I told you they were surly), this was an amazing experience. Some runners stopped for beers, margaritas, champagne, or all 3, but I simply waved as I passed by and pressed on. I was going to finish! My knee still throbbing, I pressed on, past Spaceship Earth and out the side entrance into the finisher’s chute. There it was, the finish. When I crossed, I had nothing left in the tank. I had accepted the unfortunate incident. Adjusted to the pain from the resulting injury. And advanced as best I could, and I had done it. I had finished all 26.2 magical miles. I was officially a marathon runner, a Disney marathon runner, and nobody could ever take that away from me. I hobbled over to the volunteers and bowed my head so they could place that medal around my neck. It felt amazing. I was so full of emotions, but I politely thanked them and made my way to start the process of rehydrating and recovering. But the medal? It is pretty cool. 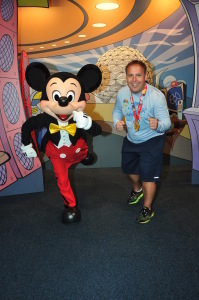 It is not my favorite runDisney medal ever, but it is nonetheless a great SMO. The medal is a nice design, features a running Mickey Mouse, and is of the great quality for which runDisney is known. The ribbon is so nice that it actually outshines the medal a little bit, but they make a great pair, and I was proud to wear my medal the rest of the trip in the parks, and to the airport, and on the plane ride home…I did not want to take it off. The post-race area worked well, especially because I had to navigate it on a bad knee. I collected my bottles of water and my standard runDisney snack box. I made the decision not to visit the medical tent as I wanted to see what walking some more would do for me knee (it turned out to just be strained, as it took a few weeks to resolve, but I have not experienced any lingering effects since). Move over Curt Shilling, I have my own bloody sock. Oh, there was one other thing. 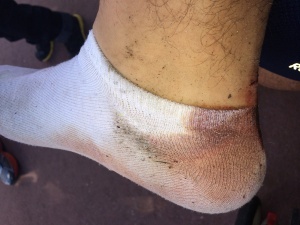 Move over Curt Shilling, you aren’t the only one with a bloody sock. After the race I looked down and noticed that the top of my right heel had worn raw from my shoe, and my sock and shoe were completely soaked in blood. As a result of my injured knee or the adrenaline, or a combination of both, I had not noticed it at all during the race. But it was a little gross looking. Since then I switched to a higher heeled sock for longer distance races and that seems to have done the trick. Unfortunately, there were so many people in this area that the cell towers were overwhelmed and I could not get ahold of my friends and family. I collected my bag check items and walked towards Epcot. Eventually I found Frank and Melissa, and we celebrated our respective and collective accomplishments. I was proud of my accomplishment, but I was even happier to have had them there for it. Oh, and the nephews? Yeah, they were just ecstatic to be in Disney World. Maybe one day they will appreciate what their dad and uncle did on that day in January, but for now, the smiles on their faces as they were at the happiest place on Earth was all that I needed to make me feel better. When you run 26.2 miles you need to have a LOT of music lined up in your playlist. I packed this list with Disney parade music and, for the first time, the complete soundtrack for Finding Nemo: the Musical. I find that, for the longer distances, longer songs and even complete shows tend to entertain me much better than shorter songs. And, over the course of 26.2 miles, a little bit of humor in my playlist goes a long way to helping me keep a smile on my face. Did I say that I was one-and-done? Yeah, about that. Not long after completing this race, I entered (and won) the lottery for the 2014 Marine Corps Marathon, and yes, I did finish that one too! 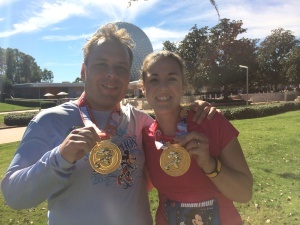 And then…yeah, I allowed myself to be talked into the 2015 Dopey Challenge. So yes, I am running this race again in January 2015. What was I thinking???? Fortunately I won’t be doing it alone, as I have a great group of running buddies with whom to share those 48.6 magical miles. 48.6 miles…what was I thinking??? ?